Maxgrout is Non-Shrink, Free-Flowing, High Compressive Strength, Non-Metallic, Oil & water Resistant, Chloride-Free, Easy-to-Use and pre-Mixed cementitious Grout for Foundation grouting applications. Maxgrouts develop very high compressive Strength and unlike metallic grouts, Maxgrout does not generate any gases leading to the failure of the bond with the surface in contact. Maxgrouts are based on the Expansive Hydraulic Setting Binders which impart controlled expansion that ensures the permanent bond between the Machine and the Foundation, Maxgrouts are capable of withstanding dynamic loads without disintegrating. Maxgrout has very high pull out bond strength and excellent dynamic load resistance. 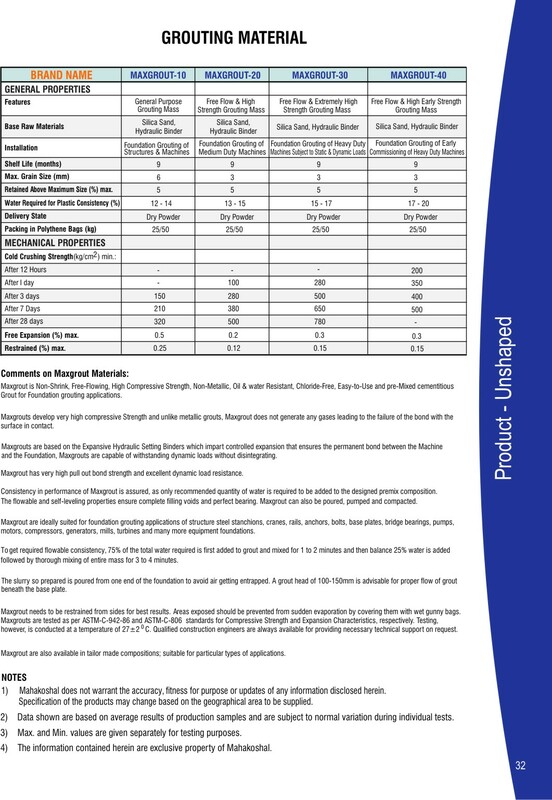 Consistency in performance of Maxgrout is assured, as only recommended quantity of water is required to be added to the designed premix composition. The flowable and self-leveling properties ensure complete filling voids and perfect bearing. Maxgrout can also be poured, pumped and compacted. Maxgrout are ideally suited for foundation grouting applications of structure steel stanchions, cranes, rails, anchors, bolts, base plates, bridge bearings, pumps, motors, compressors, generators, mills, turbines and many more equipment foundations. To get required flowable consistency, 75% of the total water required is first added to grout and mixed for 1 to 2 minutes and then balance 25% water is added followed by thorough mixing of entire mass for 3 to 4 minutes. The slurry so prepared is poured from one end of the foundation to avoid air getting entrapped. A grout head of 100-150mm is advisable for proper flow of grout beneath the base plate. Maxgrout needs to be restrained from sides for best results. Areas exposed should be prevented from sudden evaporation by covering them with wet gunny bags. Maxgrouts are tested as per ASTM-C-942-86 and ASTM-C-806 standards for Compressive Strength and Expansion Characteristics, respectively. Testing, however, is conducted at a temperature of 27±2deg.c. Qualified construction engineers are always available for providing necessary technical support on request. Maxgrout are also available in tailor made compositions; suitable for particular types of applications.